The doors to Ayyappa temple in Sabarimala opened Monday for the second time in three weeks for a two-day special puja amid unprecedented security over apprehension of protests by those opposing the Supreme Court order allowing women of all age groups into the shrine. Though no girl or woman in the age group of 10-50 years was spotted at the temple, the abode of Lord Ayyappa, its eternally celibate deity, police said it has received information about a 25-year-old woman heading for the shrine with her husband and two children. "We have got the information a woman on way to the temple but nobody has approached us so far for security," a police official at Pamba at the foothills of Sabarimala from where the pilgrims trek 5 km to the temple told PTI. Sabarimala virtually turned into a fortress with hundreds of police personnel, including armed commandos, dotting the place where surveillance cameras and mobile phone jammers were installed. Thousands of pilgrims entered the temple as temple tantri (head priest) Kandararu Rajeevaru and melshanti (chief priest) Unnikrishnan Namboothiri jointly opened the portals of the sanctum sanctorum around 5 pm. No special puja will be performed Monday, temple authorities said, adding the doors will be closed at 10 pm. It will open again Tuesday for the "Sree Chitira Atta Thirunal" puja to mark the birth anniversary of the last king of the princely state of Travancore Chithira Thirunal Balarama Varma. Several BJP leaders and Ayyappa Dharama Sena president Rahul Easwar reached 'Sannidhanam', the temple complex, in the evening. 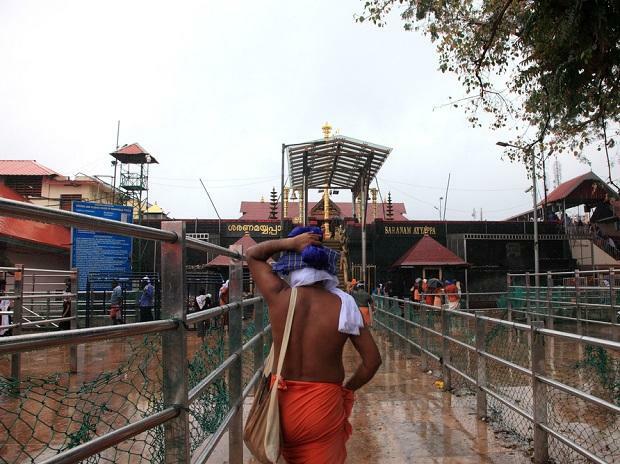 Security at Sabarimala and nearby places was stepped up following violent protests by fringe Hindu groups and mainstream political parties like the Congress and the BJP against the Kerala government's decision to enforce the Supreme Court order lifting the ban on girls and women of menstruating age from entering the temple. Frequent checking and frisking by police did not go down well with devotees and right wing activists who protested at several places. TV channels showed heated exchanges between devotees and policemen over frisking. Devotees complained of lack of amenities at the base camps that were damaged in the unprecedented floods in August. Even journalists were not allowed to leave the Nilackal base camp for Pamba on way to the temple in the morning but the restriction was lifted later in the day. Meanwhile, the Kerala High Court said on Monday pilgrims should not be harassment under the guise of implementating the Supreme Court judgment. "You can't cause hardships to pilgrims," the court said while hearing a petition seeking its direction to the government not to interfere with day-to-day affairs of the shrine. Police and civil administration are on a high alert, officials said, adding prohibitory orders under section 144 CrPC were in force around the temple and will continue to be in place till Tuesday night when the doors of the shrine will close. Around 2,300 personnel, including a 20-member commando team and 100 women, have been deployed in Sabarimala and adjoining areas. According to official sources, police has prepared a dossier of Hindu right wing activists who are likely to visit the shrine to take part in the agitation against Kerala's Left Front government's decision not to file a review petition against the apex court order. At least 15 women police personnel aged 50 years or more have been deployed at the 'Sannidhanam', officials said. When asked about why only women personnel over 50 years of age were deployed inside the temple, Inspector General of Police M R Ajith Kumar said women staff of "eligible" age from various departments have been deployed at the temple for quite some time. He also rejected allegations that devotees had to face hardships due to the restrictions imposed by police. "Here, devotees can come and have darshan. There are no restrictions. Police has arranged adequate security for all devotees," Kumar said. The doors of Sabarimala had opened for six days on October 17 for the first time since the Supreme Court allowed women of menstruating age to enter the shrine but none could make it to its hallowed precincts amid a welter of protests and violent clashes. Valiant attempts by around a dozen women, including activists and journalists in the 10-50 years age group, to script history came to nought as frenzied devotees of Lord Ayyappa heckled and hassled them and forced them to retreat. Both the Congress, the main opposition party in Kerala, and the BJP, which is desperately seeking to expand its footprint in the state, have lent support to the agitation against the Supreme Court verdict.